So, you might not want to get behind the wheel of a car after eating a slice of this unique cake. Or try to recite the alphabet backwards. Or even attempt walking a straight line. OK, I exaggerate — but just a little. You see, this cake has absinthe in it. Yes, the potent Green Fairy, the once illicit spirit that was once thought to be hallucinogenic (a notion that’s since been debunked) that’s typically 100-plus proof. 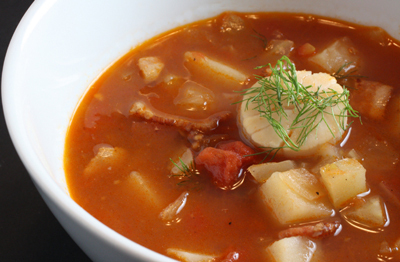 The recipe is from “The Sweet Life In Paris” (Broadway Books) by cookbook author and blogger extraordinaire, David Lebovitz. There’s 1/4 cup of absinthe in the batter, which largely mellows through baking. But there’s also a glaze of sugar mixed with another 1/4 cup of absinthe that’s brushed over the cake after it cools, giving it the appearance of a winter white icing. This glaze is so wicked strong that my husband wouldn’t even let me give him a few slices to take to his colleagues at work, because he feared they’d all end up tipsy. 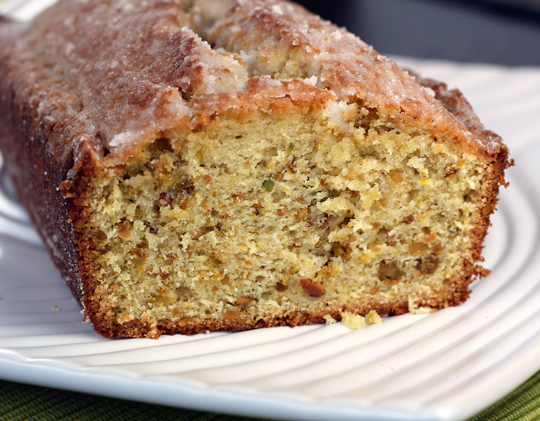 This moist, anise-forward cake is made with a little almond flour or stone-ground cornmeal. 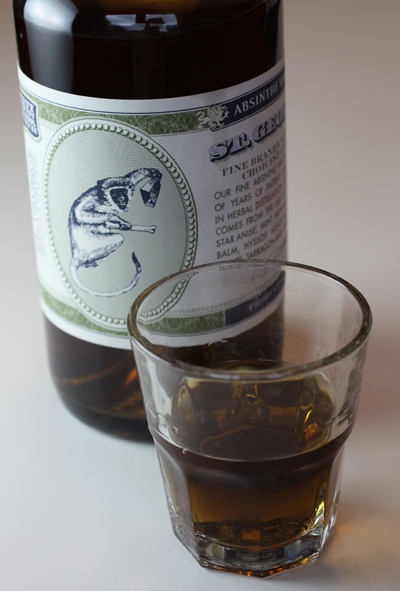 However, you also can use pistachio meal, which will give it a faint yellow-green tinge like that of absinthe. To make your own 1/2 cup pistachio flour needed in this recipe, just grind up about 3/4 cup shelled, roasted, unsalted pistachios in a blender until fairly fine. It will still be pretty coarse. It won’t be as fine as flour, but more like gritty sand. I like using the blender for this as opposed to a food processor, because you can grind the nuts finer without risking it all turning into nut butter as quickly as in a food processor. 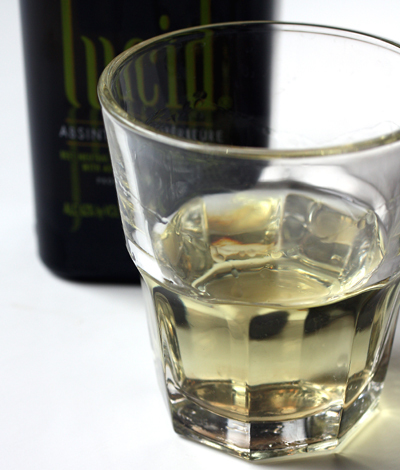 Just as when cooking with wine, you want to bake with an absinthe that is good enough to drink. 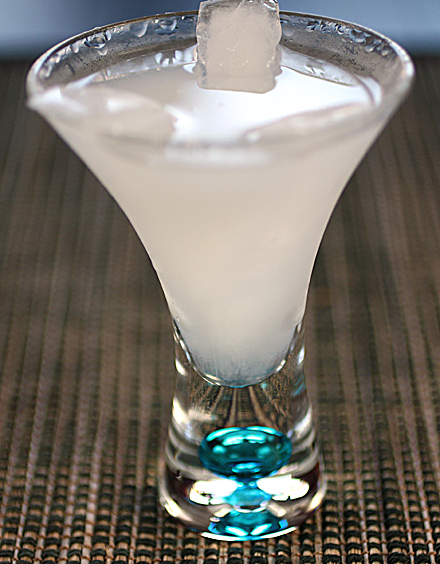 I had a sample of Lucid absinthe on hand, so that’s what I used in my cake. 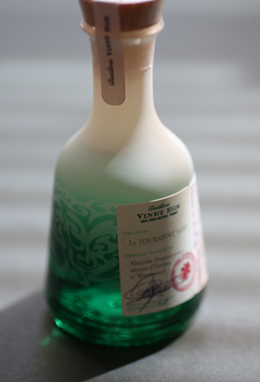 This French-made spirit was the first absinthe allowed to be imported into the United States in 2007 after the Alcohol and Tobacco and Tax and Trade Bureau ruled that absinthe could be sold here again for the first time in more than 95 years. 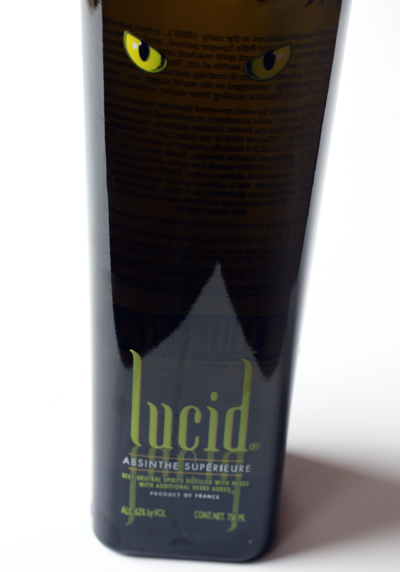 With its distinctive cat-eyed decorated black bottle, the 124-proof Lucid has a mellow anise-herbal taste that’s pleasant enough for even someone like me, who normally hates black licorice but loves fennel (I know, go figure). 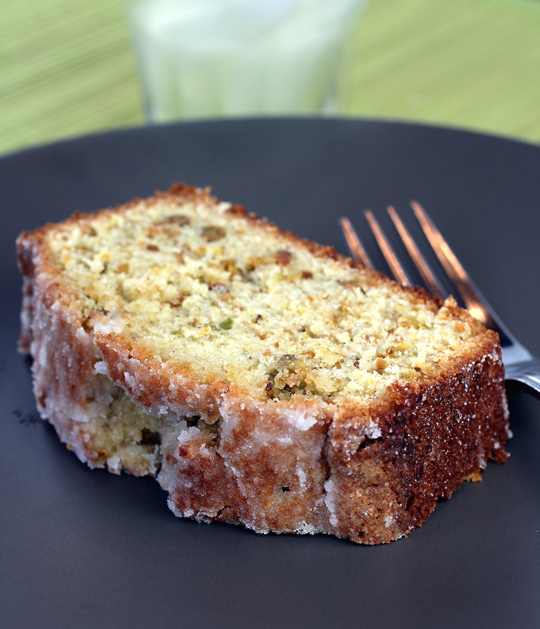 It worked well in this cake, especially with the ground anise seeds in the batter that accentuated the fennel flavor even more. 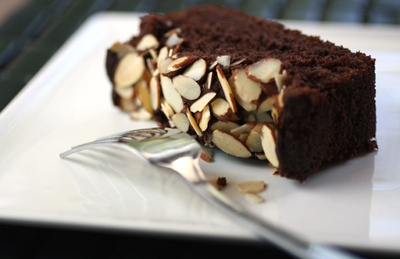 Enjoy this cake with a kick. 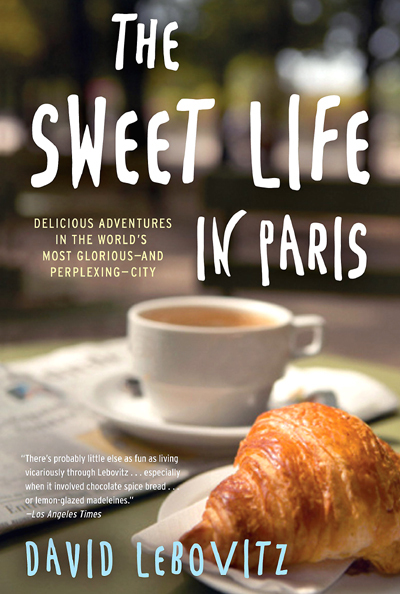 CONTEST: Three lucky Food Gal readers will win a copy of “The Sweet Life in Paris,” which just came out in paperback. The book recounts the amusing ironies and foibles that Lebovitz, a former pastry chef, encountered when he first moved to Paris. It’s also filled with recipes, such as this one for absinthe cake, inspired by the City of Light. Entries, limited to those in the continental United States, will be accepted through midnight April 2. The winner will be announced April 4. Just tell me your favorite memory of Paris or why you most long to visit there. Best three answers win the books. WINNER OF LAST WEEK’S CONTEST: In the most recent Food Gal contest, I asked you to tell me what your favorite cereal was when you were a kid — and why. 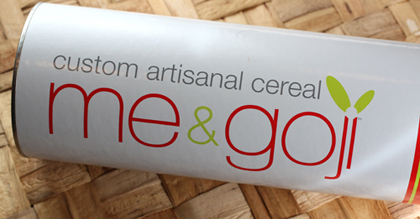 The winner will get a chance to design their own custom cereal blend for free at Me & Goji. Preheat oven to 350 degrees. Butter a 9-inch loaf pan, then line the bottom with parchment paper. Crush anise seeds using a mortar and pestle, or in a freezer bag with a hammer, until relatively fine. Whisk together the white flour, nut flour or cornmeal, baking powder, salt and anise seeds. Set aside. In the bowl of a standing electric mixer or by hand, beat butter and sugar until light and fluffy. Add eggs one at a time, until completely incorporated. 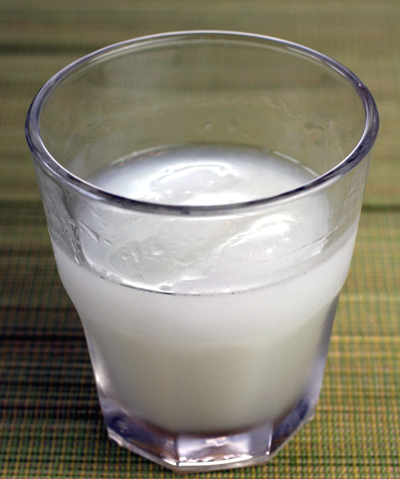 Combine milk and absinthe with a bit of zest. Stir half of the dry ingredients into the butter mixture, then add milk and absinthe. By hand, stir half of the dry ingredients into the butter mixture until just smooth (do not overmix). Smooth the batter into prepared pan and bake for 45 to 50 minutes, until a toothpick inserted into the center comes out clean. Remove cake from oven and let cool 30 minutes. Remove the cake from the pan, peel off the parchment paper, and set the cake on a cooling rack over a baking sheet. Baste the cake with the absinthe glaze over the top and sides. Continue until all the glaze is used up.